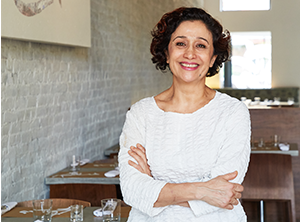 For Nasim Alikhani, co-owner of the Iranian restaurant Sofreh in Brooklyn, cooking both allows the world outside to disappear, and to make lost worlds re-appear. It is the thread that ties together her childhood in pre-Revolution Iran, her 20s in New York when she was a student and nanny trying to make ends meet, and now her life as a restaurateur. On this uplifting episode of Speaking Broadly, Alikhani describes her gratitude for early hardship and later happiness, how optimism grows with experience, and how she thinks about the lifespan of a passion project.